The quick way I like to load brushes and patterns (instead of using the rather complicated way explained in the PDF) is to just open up Photoshop and then double-click on the brushes file (.abr) and they will load automatically. This is the same for the pattern (.pat) and action (.atn) files. Very simple. 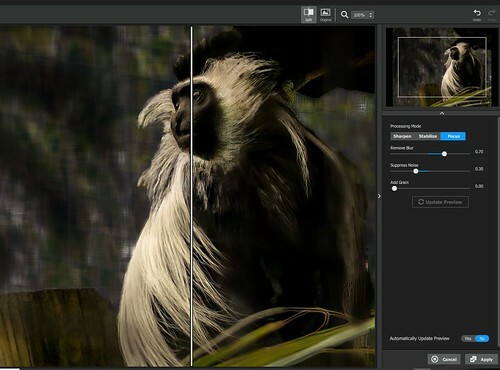 The Angolan Colobus Monkey above pretty much followed everything Nuwan tells you to do in the nice Guide although on the Adobe site there are two short videos that go over pretty much the same thing. If you do not want to watch the videos, I have created a synopsis of what was in his videos below these photos. Make sure your image height and width parameters are between 2000 and 5000 px. Otherwise your image will be huge once the action is run completely. I tried this and got a 2.4 Gig image – my computer was not happy! Therefore, I changed my image size into one for the web before running the actions. Make sure your image has a full range of tones with shadows, highlights and midtones before you start. After running the Setup Action, use the selected hard-edged brush called Watercolor Artist Basic Brush to paint in your “focus area.” Set the Opacity and Fill of all the brushes to 100%. I tried using the focus brush at a lower opacity to in bring less of certain areas, and it just did not look right. Can change the default orange color to a sampled color from the image and it will add more of that tone into the resulting watercolor image. A bright pink was used in the Coleus Plant image to give it more pink tones instead of orange. Apparently other selection tools can be used such as the Lasso or Quick Selection Tools, and then fill the selection with the foreground color, but Duwan finds using the brush is the easiest way to define your focus point. Don’t make the whole image the focus area as different brushes and layers are used for areas outside the focus area than for the inside. The focus area can be painted close to your subject or it can include areas outside the subject. In the Monkey image above, it was set outside a little which is why the foreground rock and greens have more definition than the background which was really busy in the original photo. Nuwan says that a focus area with regular and simple shapes will generate fewer brush strokes than selected areas with complex lines. Also do not leave a bunch of holes in the focus area – it will not look good and they are hard to even out later. This action converts the image into an 8-bit image. When the Watercolor Artist action is run, it will take a while to process. He says that for a 3000 px image, it will take less than 3 minutes. It took me less than 3 minutes, but I am using smaller images. The result will look a little scary if nothing else! 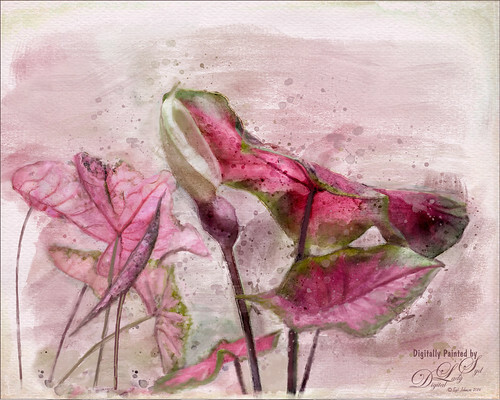 There are 8 groups that cover all aspects of the resulting watercolor image. The PDF does a pretty good job explaining the different groups so I will only go over what I found really helpful. First open up the Image Control group and highlight the Reveal Details layer. Choose a watercolor brush and paint in the mask with white. He used his Watercolor Artist-Medium brush just to help you get started at this point. The last 12 brushes were used in the action and do not necessarily work with this layer for painting. They can still work for special effects though. Paint over in the highlighted layer mask some of the important parts of the image to bring back the details. If you have other watercolor brushes that you really like, there is no reason you cannot use them on this mask. 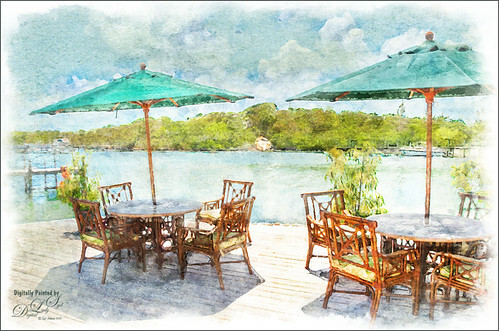 In the same Image Control group, select the Custom Watercolor layer. Paint in the layer mask with different brushes to add the custom effects around the subject. It can be duplicated several times to add different types of strokes. The opacity of the layers can be adjusted to give interesting results. Duwan used the Watercolor Artist-Dry brush for this. I used the same brush on my images and used extra Custom Watercolor layers. Add Shadows, Add Midtones, Add Filling – try different blend modes for these layers and note that the opacity is controlled by adjusting the layer Fill slider and not the Opacity slider. By increasing the Fill on the Add Filling layer, it will fill in some of the empty areas of the watercolor effect – try some different blend modes like Multiply for a look. For Add Shadows and Add Midtones layers, try Darken, Multiply, and Color Burn blend modes. Texture Overlay, Fine Sharpen, Sharpen – All use the Fill slider to adjust the opacity. The Sharpen layer is the one most affecting the final image. The rest of the groups can be opened and layers opened and closed to get add or remove different effects – a lot of sketching and splatter strokes here and layer masks are provided to easily remove unwanted marks on your image. The opacities can be lowered individually or as a group. Different papers or textures can be substituted for the ones provided including any painted textures you might own. The Post FX group is one where many different adjustment layers are located – this can really help add the tones or colors needed to make the image really look great. Syd’s Tip: I found this is really necessary to get all the foci of the images to look correct. 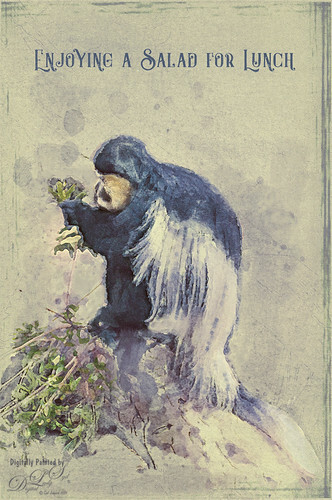 After making a lot of the adjustments in the various groups, either create a selection, as in the Monkey image where the face was duplicated with a Lasso Tool, or as in the other images where the whole background layer was duplicated – then place on top of the Watercolor Action group. Add a black layer mask and with a watercolor brush at a lower opacity like 20%, areas that needed a bit more structure can be painted back in. The actual layer opacity can also be adjusted if the result is too much. And if you are a bit of a digital painter, it is important to have a brush handy to clean up the edges and areas that need a little clean up. That is what was done on the pink Coleus Plants. As a final step for me a stamped layer of the image was opened in Topaz (for website link, see sidebar at my Tidbits Blog) Studio using the Texture Adjustment’s Group set to Borders. There are several choices and the borders can be flipped, color changed, and blend mode and opacity changed. This was done on both the Monkey and Coleus images. I just painted a white watercolor border for the Bahamas image. This week I am getting back to just having some plain ole’ Photoshop fun! Recently I ran across an easy and quick technique to turn an image that looks ho-hum into something great! There are times when an image does not look quite right no matter what is tried. That is when I usually open one of Topaz’s (see the sidebar at my Tidbits Blog for website link) creative filters to see if something connects with me – that is usually the fabulous Topaz ReStyle plugin. (See blog links at bottom of post for more info.) But if you do not own ReStyle, this a pretty nifty way to get a somewhat similar result using a Gradient Map Adjustment Layer. The last two examples do not have extreme color changes, but by adjusting the layer opacity, which seems to be critical in getting certain looks, or trying different blend modes, very interesting results can be obtained. What does a Gradient Map do? Photoshop maps the shadows in an image to the foreground color and the highlights to the background color. 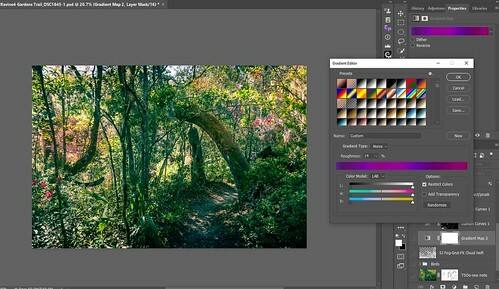 It also allows you to add as many colors as you want by using the Gradient Editor while still maintaining some of the photo’s original tonality. For more on using a Gradient Map Adjustment Layer for black and white images, see my blog links at end of post. Open Gradient Map Adjustment Layer and set the Blend Mode to Color and the Layer Opacity to roughly 50%. Don’t worry about the actual colors in the color swatch. Click on the gradient strip to open the Gradient Editor dialog. Set the Gradient Type to Noise. Set the Roughness somewhere under 15%, usually nearer to 10%. Set the Color Mode to HSB or LAB. Click Randomize as many times as you need to get an effect that looks good. If the colors are too intense but look good, go out of the dialog and change the layer opacity – less than 50% is best. The Photoshop Wow Book (from years ago but still one of the best PS books around) is the only good source I could find on how the Gradient Map Dialog Box actually works so the following info is from this book. By checking the Add Transparency box, random transparency is provided – by checking this box “….will probably introduce more variability than you want to cope with” so instead use a layer mask after the Noise gradient is applied. The Noise Gradient ranges are set by moving the sliders on the Color Model bars which will determine the Outside limits of the colors that can appear in your gradient but the gradient will often include a much narrower range of colors. The Wow Book also provides the following definitions: Roughness: a higher amount makes more and sharper color bands and a lower amount has fewer bands and smoother transitions. Restrict Colors is checked so that the gradient will not include any colors too saturated to be printed with CMYK inks. To create a gradient of just gray colors, set the Color Model to HSB and set the Saturation all the way to the left – now only the Brightness tabs will have any effect on the image. I could not get a very good result doing this. 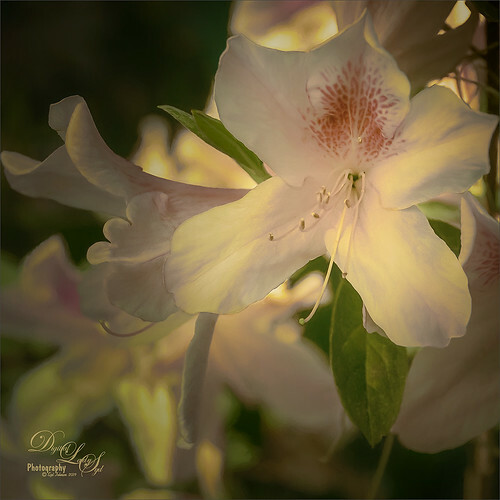 The pretty Azalea below was also taken at Ravine Gardens in Palatka, Florida and is another example of this workflow. Below are the settings used in the photo above – click on image to see larger in Flickr. The blend mode was still set to Color and the Layer Opacity was set to 55% – any higher opacity and the image becomes very yellow. A different gradient was tried below. A screenshot shows more of a blue toned gradient applied. Used Color blend mode and 42% Layer Opacity. The image is not finished, but it does give a very different pretty result. 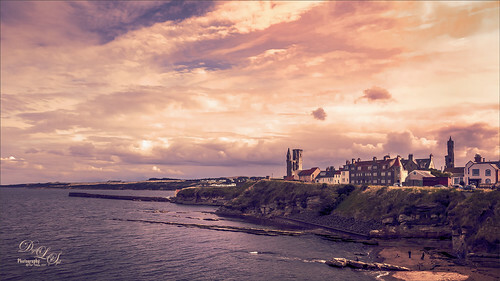 This last image of Old St. Andrews in Scotland is an example of combining the two types of Gradient Maps – the first was a Noise Gradient Map (see screenshot for how image looked before applying the Gradient Map Adjustment Layer – click on it to see settings more clearly in Flickr). On top a regular Solid Gradient Type instead of Noise was selected and Blake Rudis’s action and his gray gradient 19 set to Soft Light blend mode at 41% Layer Opacity was added. Blake has a really good video called Advanced Color Toning Made Easy and he gives away the action and 20 gradients so check it out. It’s a very handy action and I use it all the time! This combination seems to bring some very good results in the images. It is not a huge change but definitely an improvement. Recently Topaz (see sidebar at my Tidbits Blog for website link) released yet another new AI (Artificial Intelligence) filter called Sharpen AI – this comes as a real surprise since just a a while back JPEG to Raw AI was released. What is interesting about this new release is that it was actually based upon the older Topaz Infocus filter. And if you already own Infocus, you get the new Sharpen AI automatically. I love Topaz for this – they do honor their company commitment that if a filter is upgraded and you own it, you get the upgrade free! See section below for info on how to do this as there appears to be a lot of confusion with this. Let’s start by showing what Sharpen AI’s interface looks like and does. I have added several sections so if you are not interested in all the details, you can skip through some of them. Above is the lovely Siberian Tigress named Dorcas at the Jacksonville Zoo – what a lovely creature she is! Sharpen AI And AI Clear both improves an image’s sharpness and reduces its noise. There is a difference with how they each deal with noise reduction. In AI Clear the noise is adjusted by clicking on Auto or the Low, Med and High buttons. So one of these settings must be chosen. Click on the image below to see the settings more clearly in Flickr. There are three modes that can be tried on the image before applying it. I like this since one may not work as well as another. I am finding that the mode I thought I should use is not always the best one. Sharpen Mode – this setting is supposed to only sharpen the things you want and brings out the detail in your image – Topaz says it “only sharpens the good stuff” and I guess this is where the AI comes in. It figures out what needs to be sharp in your image. Stabilize Mode – it is supposed to be best when used with moving objects or low light situations. It “stabilizes” the motion blur that results. 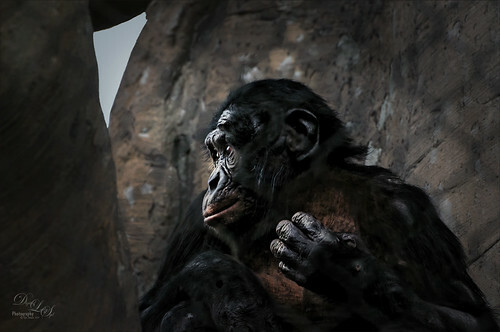 Focus Mode – Topaz says it “rescues a blur within ten pixels” so that a slightly out-of-focus shot becomes much sharper. If part of an image is in focus, like the eyes, but the nose is not, this mode will fix that and bring the nose in focus also. The Remove Blur slider is the main slider to adjust any of the three modes. They advise against setting it to 1.00 but I use 0.70 quite a bit. It can make the image look too crunchy but that may be okay if you are just using this filter for just the eyes. (See next section for more on this.) As noted above the Suppress Noise slider will reduce the noise in the image and is set to 0.50 as a default. I am also finding that this can be reduced to give some better results if you do not need the noise adjusted. Add Grain slider is only needed if the Mode over corrects your image resulting in an unnatural surface smoothness or loss of too much detail – some texture can be added back this way. It is probably not something that needs to be used often. I usually use this filter from Photoshop since I like to tweak the results once applied. It also is much easier when using the masking as I am describing in this section. I am also finding that the Focus mode fits my problem areas in photography – many people also like the Stabilize mode. One of the best uses for Sharpen AI is to apply it so the eyes so look really sharp, then go back into PS and add a black layer mask to everything but the eyes. Paint them back with white at any brush opacity to make it look good. I have not tried this on a person pix yet but saw this demonstrated with great success. The Guereza Colobus Monkey above used the Focus mode with Remove Blur at 0.70, Suppress Noise at 0.30 and Add Grain at 0 (therefore more sharpening and less noise reduction smoothing) on a layer in PS. 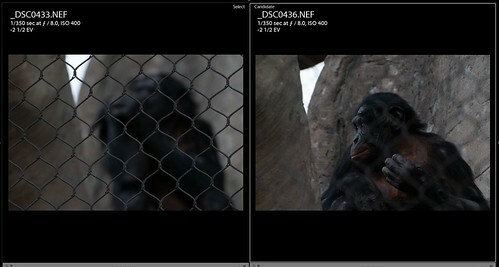 In PS a black layer mask was added and just the monkey and foreground was painted back for sharpening. Click on screenshot to see large in Flickr. Other work was done in Photoshop like using a Lighten Curve to lighten him up a little and the palm shadow was added to take the distracting background away (see 15 Shadow Mockup Overlays by andshesbrave). I am often sharpening the whole image and then masking out completely the other parts of the image in the PS with a 100% white brush or using a lower amount set to reduce part of the effect in the mask. Also Blend If sliders could be handy here. Below is an example of a landscape hand-held from of all things a bus! Sharpen AI really pulled out all the rigging lines that I have never been able to get clear – this filter saved my image – it may not be the best I have ever taken, but it sure is one of my favorites from Scotland. The filter made the image usable and that is probably the key to what makes a filter a good one. All your images are not going to be that great but some definitely have more meaning and need to be saved of those precious memories. Above, this whole Scottish image was sharpened, probably a bit too much – used settings of Processing Mode Focus, Remove Blur 0.70, Suppress Noise 0.80 and Add Grain 0. Then back in PS a black mask was added again and just the sailboat and its lines were painted back which made them very sharp. Using the Focus mode sharpened these lines up beautifully – never have been able to do this with any other product. AI Clear could not help this image. Then I took the image into Topaz Studio where Precision Detail was applied just to the boat. Several other clean up and color toning steps were done but the sharpening on the boat makes this image. I am finding it is best not to use both AI Clear and Sharpen AI on the same image. It will usually over sharpen the image and add artifacting. You can add other forms of sharpening like using the PS High Pass to sharpen or the Sharpen Tool on special areas with either filter. Just be sure to localize your sharpening when doing this. The Monkey above also had a High Pass added at the end of my workflow but it was only added selectively where the foreground elements needed just a bit more sharpness. In other words, this filter does not do it all, but it is a great place to start, especially if an image needs a little extra help. What is the Difference between AI Clear and Sharpen AI? The big question is “Why do I need this filter?” To be honest, I rarely used Infocus so I was as perplexed at this as everyone else. And now that AI Clear is such a fabulous product, is it needed? Let’s address AI Clear first. Since Topaz fixed AI Clear back in October of last year, I use it on almost every image I post-process. I think a lot of people feel that way – I have yet to find another filter that does what this one does in just a couple clicks. 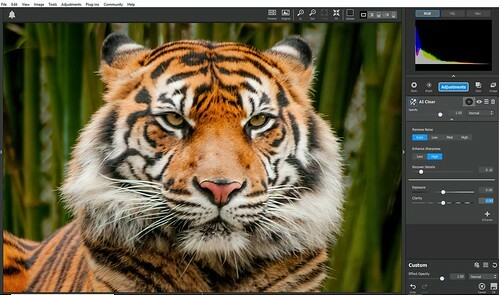 It is fast and easy to apply from either Lightroom, Photoshop, or Topaz Studio. It almost always improves an image’s sharpness and reduces its noise. It seems to me that Topaz Sharpen AI should be used for images that have what I consider bigger issues. Topaz claims it is a great asset for shots taken when hand-holding the camera. “The machine learning training process allows it to understand the difference between detail vs. noise. This means that it can selectively apply sharpening to just the image features it perceives as detail.” On landscapes it brings back detail in all parts of an image while removing noise. Sharpen AI is both a stand-alone (which will only accept Tiff, Jpeg and Png files but plans to add Raw file capability are in the works) and a plug-in that can be accessed by Lightroom, PS and Topaz Studio. NOTE: A big tip is to be sure the Automatically Update Preview is set to No or else you and your computer will be going crazy as it keeps updating the filter! 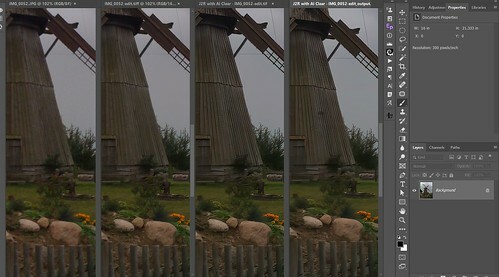 The Stabilize and Focus modes in Sharpen AI are not contained in AI Clear – they originated from the original Infocus techniques. It is not fast at processing and can be down-right slow when saving the final settings to the image – this depends on the size of the file you are using. The Tigress image took 2 minutes to save on my computer which has a pretty fast processor. I did run the Shake Reduction filter in Photoshop (remember when we thought this was the greatest filter ever????) for comparison and it is not even close to either Sharpen AI or AI Clear – we have come a long way with this technology. Topaz describes the subtle differences between the two programs by saying: “AI Clear’s main detection is noise whereas Sharpen AI’s main detection is to recognize blur. This makes Clear optimal for noisy images and Sharpen more effective for a bit more blurry images.” I believe this is true with my experience using both programs. Sharpen AI does not have batch capability – it is too computer intensive at this point while AI Clear does have the capability. Not sure if you own Topaz Infocus? Check out your Topaz Labs Account for purchased products – should be able to tell if you had this plugin originally. 1. Download a trial version of the program and load it on. It should say you have a 30-Day Trial at the top of the program. 2. Now click on the Help Menu and select Update Ownership which should be the second item in the drop-down list. Just click on it and it will remove the Trial information. Log into your Topaz Account. Click on Coupon either on the left side of your account page or under Account > coupon then click on the coupon tag. Next go to the Stand alone > Sharpen AI menu at the top of the page and select Sharpen AI. Once on the page, scroll to the bottom and find Buy Now. Once you have the cart it should show the price minus the coupon. Then check out normally to purchase. Finally, download or if you are using a trial go to the Help menu > Update ownership (in the program) and it will change from trial to normal version. I am starting to like the Sharpen AI better the more I use it but no way am I getting rid of my AI Clear! Sharpen AI is very slow and I can get fairly similar results with AI Clear and a little Precision Detail or Precision Contrast in Topaz Studio – that is when using an image that is in pretty good shape. 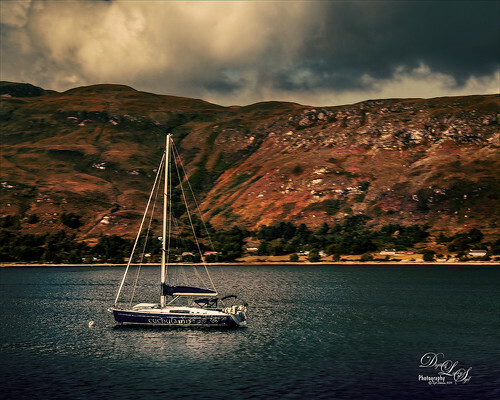 If your image does not have that really tack sharp image result (and many of mine do not as seen in the sailboat image), Sharpen AI may really be the answer for you. I believe that as time goes on, Topaz will be updating this plug-in, like they did with AI Clear, and it will be a much faster and better product. In the meantime, I am going to continue using it to see when it is best for my own images. I know this is not a definite answer, but I trust Topaz and believe they will improve this filter to where it will be a no-brainer to use it (like AI Clear is for me right now). I do believe Topaz is going in the right direction with all the AI plug-ins and are working very hard at staying on top of this new technology. Kudos to them for that! I will continue to keep you updated on all their new products – I love the Topaz products. They fit into my workflow very well. As promised last week, here is the second new (to me) vignette technique that I am using all the time now. 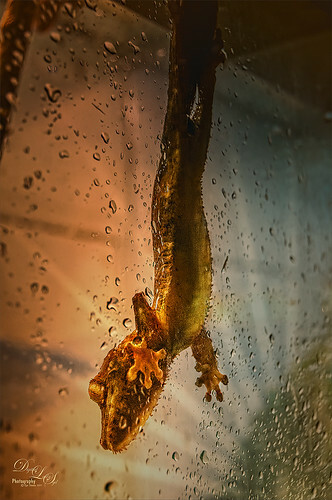 It works really well when you have a single subject like this Henkel’s Leaf Tailed Gecko image taken at the Jacksonville Zoo. This technique was demonstrated by Unmesh Dinda’s (the new PS guru who has so many tricks up his sleeve that I can’t keep up with his posts) excellent video called How to Match Subject and Background – Part 1. You can really drive the vignette towards your subject very easily. 1. 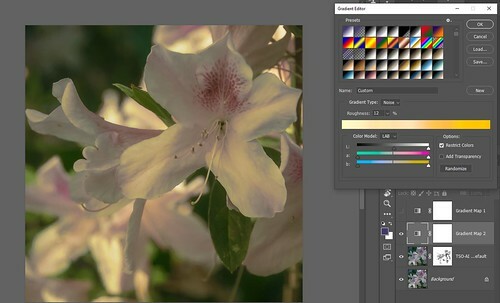 Select a Levels Adjustment Layer and set the Output Levels to 0 and roughly 90 – 100 – really darkens down the image. 2. Create a large, hard edged round brush – mine is set to Size 1900 pixels, Hardness 100%, and Opacity and Flow at 100%. If you plan on using this vignette often, it would be a good idea to save the brush settings as a Brush Preset. 3. 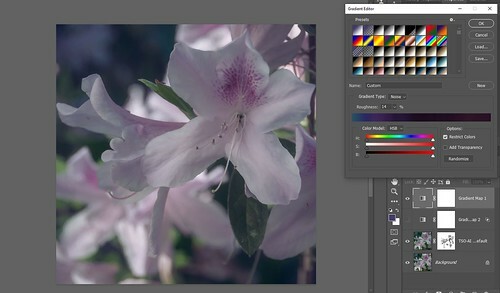 Set the color swatch to black and click one time on your subject in the Levels layer mask with the new brush. 4. Select the Transform command (CTRL+T) and pull out the white circle to fit the subject more closely. It can be rotated and distorted to fit the area to keep clear of the vignette. 5. Next click in the Properties tab (the black round hole in a white square icon) for the Levels Adjustment Layer and set the Feather to 350-500 pixels – very large and soft. Can Free Transform again if it does not look correct. 6. Adjust the layer opacity if effect too dark. You can see the way the vignette is centered on the little flat hand on the glass and his head. I wanted to emphasize the interesting background pattern that comes from the right corner also. This type of vignette was exactly what was needed – 500 pixel feather was used on this image and set to 59% layer opacity. 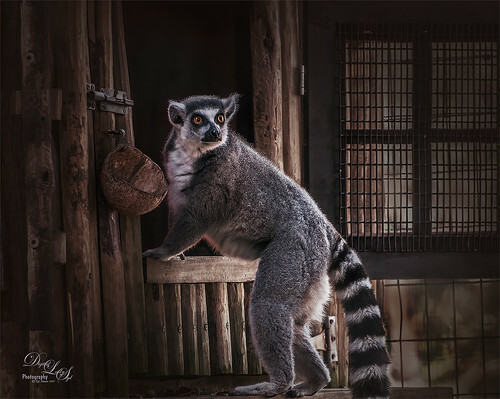 This ring-tailed Lemur whose image was taken at the St. Augustine Alligator Farm (he definitely looks like he was caught with his hand in the cookie jar!) also uses this same technique. Very little was done to this image other than using Topaz (see sidebar at my Tidbits Blog for website info) Studio’s wonderful AI Clear to sharpen him up a little, and a Gradient Map Adjustment Layer to even out the colors a little (see a nice video by Blake Rudis called Color Toning in Photoshop with Gradient Maps and Soft Light Blend Mode where you can download 26 gradients to use with this technique – I used his Gray Gradient 23 for this image which gave it this lovely warm tone). Last step was the Vignette Effect set to a 386 pixel Feather in the Properties Panel. The vignette color was changed to a brownish tone sampled from the image. To do this, a Solid Color Adjustment Layer was clipped (CTRL+ALT between the layers or can go to Layer -> Create Clipping Mask with the Solid Color Fill Adjustment Layer highlighted) to the Levels Adjustment Layer. It is fun to try different colors to see if one really makes the image pop. The Levels Adjustment Layer was then set to 84% layer opacity. I think it was a nice addition for this particular image’s vignette. 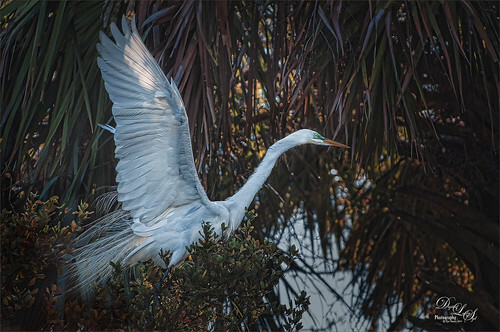 This beautiful Great Egret was in the mist of taking off (the Rookery is getting very busy at the St. Augustine Alligator Farm) when I caught this snapshot – it was not processed using LR/ACR – but just Topaz Studio’s AI Clear and Topaz Adjust was used to get the pretty details in the wings. There was a little blue haloing in the sky area so it was changed using one of my blog techniques called A New Look at Chromatic Aberration where a Gaussian Filter is applied to remove it. The vignette was added as a last step with the Feather set to 200 pixels. This blog is a little “long-winded” but it is something I have been trying to figure out and thought I would share. For the last several weeks I have been getting totally confused by all the new Artificial Intelligence (AI) software/plugins/filters and what qualifies them as AI software. This past week Adobe’s Lightroom/ACR modules gave us a new taste of their AI capability with the Enhance Detail command. I decided to do a quick recap on a few of the AI programs. The final image above used Topaz (see sidebar at my Tidbits Blog for website link) Studio’s AI Clear and AI ReMix. I have used the new AI masking capability in On1’s very recent update and gotten good basic masking results. Also Skylum has two filters, Accent AI Filter and AI Sky Enhancer Filter which are very nice effects on images – check out article on what Skylum’s AI team is doing. 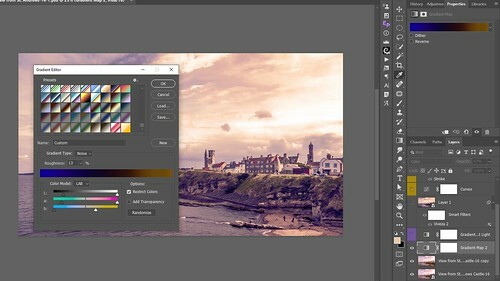 Adobe Photoshop has previously used AI to upscale images in the Image Size dialog and in the Quick Select Tool’s Select Subject option and now calls their AI Adobe Sensei. Since these other filters are a little different than these I am showing, I will try to do another blog on their AI Technology. There is so much info on AI that I could create a humongous blog! I found a blog from a C-Net article with this nifty definition -“Enter artificial intelligence — specifically the neural network technology loosely based on human brains’ ability to learn from real-world data, not rigid programming instructions.” In the article Adobe senior research scientist Vlad Morariu said “Using tens of thousands of examples of known, manipulated images, we successfully trained a deep learning neural network to recognize image manipulation.” This may be what started the whole AI software evolution for photographers. 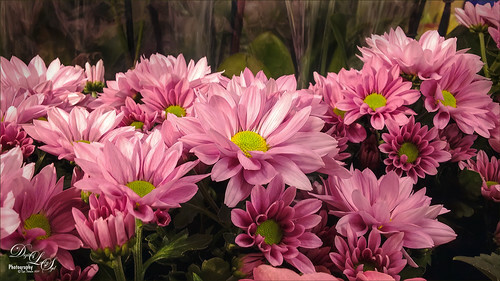 As a good example of how AI is being used effectively in photography software, Topaz Labs ReMix adjustment says on their website that they collected hundreds of classic and contemporary artistic samples; then spent hundreds of hours developing a custom neural network to identify specific artistic styles and replicating the textures, colors, edges and shapes of those styles; and finally the results were put into an adjustment for Topaz Studio. This seems to be the basic process for a lot of the AI software being developed. 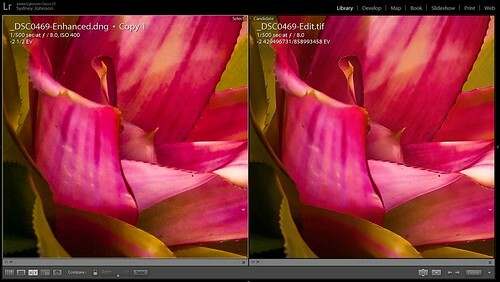 Here is a screen shot of the flower shown above zoomed in to 100% to show a comparison of Lightroom/ACR’s Enhance Detail applied (for LR Develop Module right click and select and in ACR right click on the left strip and select) vs. Topaz Studio’s AI Clear, which was applied with LR as the host program. For a larger view in Flickr, click on image. The results to me looks like the DNG file has more texture in it but very similar sharpening – that would make sense since AI Clear has both Noise Reduction which will reduce the texture effect and Sharpening capabilities. All the settings were the same including the Details Panel sharpening and noise before applying the Enhance Detail or AI Clear. (I know, Topaz says do not do this but I do it all the time and it works just fine.) This may be a draw as far as which looks best in this case – the new LR/ACR Enhance Detail works pretty good as well as the AI Clear. 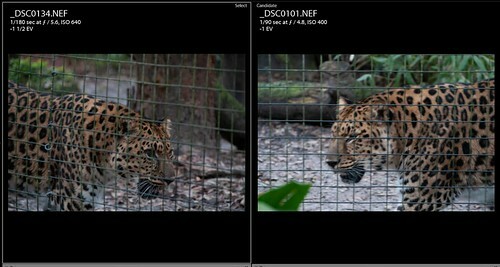 But Lightroom/ACR creates a much larger DNG file while Topaz creates a Tiff. I find AI Clear probably the best product out there for subtle sharpening that is needed, especially when hand-holding your camera while shooting. Also Detail Enhance is not available in the Camera Raw filter as far as I can tell, only available when doing your original post-processing. Therefore, if you may want to get back to apply it, definitely open as a Smart Object from ACR or Edit ->Open as a Smart Object in Photoshop from LR. For the Enhance Detail command Julieanne Kost, a PS evangelist, says “I would suggest applying it on an image-by-image basis starting with images that have visible artifacts and which require the highest level of quality (images that will be printed in large format, for example).” Topaz Labs says for AI Clear use it on all kinds of images including High ISO with lots of grain, Nighttime with noisy skies, Action images with some blur, and Telephoto lens shots. My choice at this point is Topaz AI Clear – often my images are just a bit soft and this works wonders – and I can access it as a filter using Topaz Studio in PS on a layer – very easy and quick. Image above is the final result after running this file through the various Topaz AI programs – it was from a very old IPhone and had a lot problems already. 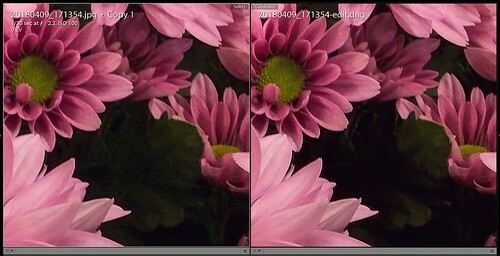 I do not believe there is an easy way to compare these two standalone packages from Topaz – they each do something that the other does not do, but there appears to be some overlap to me, like in sharpening or noise reduction. JPEG to RAW was specifically developed to take old phone (or current in some cases) and old digital camera jpg images and put them into a RAW format for better post-processing. (See my What Is Topaz’s New JPEG to RAW AI? blog.) I have always loved Topaz AI Gigapixel because it will take a really small image and enlarge it to something that looks pretty nice and detailed. (See my The Best New Software Around-Topaz A.I. Gigapixel! blog for more on it.) 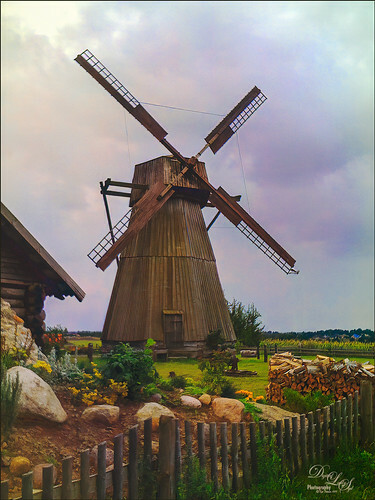 Below is a screen capture of how this image actually looked as the original windmill image, then after running running it through JPEG to RAW, then AI Clear adjustment in Topaz Studio, and finally AI Gigapixel (which is at half the zoom since it was doubled in size). This gives a pretty good idea of what is happening here and what basic order to use the software in. For a larger view in Flickr, click on image. The final image was finished up with some Topaz ReStyle effects (not an AI plugin but still one of my favorite Topaz plugins). What is Topaz AI ReMix???? Topaz ReMix – Update and Better Than Ever! Updates, Updates, Updates! What To Do???? There’s the easy way and there’s the hard way to do this. And since I love taking images at zoos, I usually fall somewhere in between when post-processing those images with the ugly fence patterns in the foreground. So this blog hopefully will help with some of these issues. 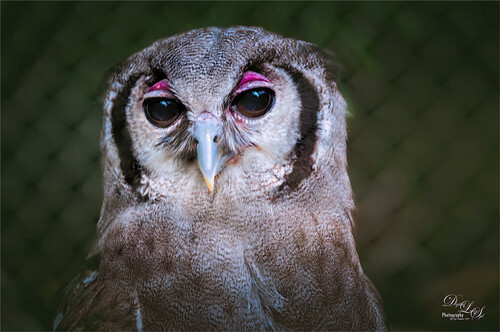 I was so excited to get this beautiful Verreaux’s Eagle Owl image while at the Jacksonville Zoo with my Photo Club – BTW the Zoo is in the process of updating and it is looking fabulous! This guy was located in a very shady area hidden behind heavy black fencing (see images below) and definitely was very hard to see. This guy was so close, like 3 feet and he looked to be at least 2 1/2 feet tall, and yet I could not see his beautiful eyes or beak. It was a major surprise to see he had such colorful eyes and beak once downloaded on my computer! I love birds but the fencing here was so frustrating! (For more on the post-processing, see Image 1 at end of blog – check out how the Charcoal Filter was used for the background of this image.) The closer you can get to the fencing, the easier it was to remove the lines. But I had done my homework this time and set up my camera to try and eliminate the fence lines. This short 2 minute video called Zoo Tip: Make the Cage Disappear by Tim Migot totally made the difference. The con to this technique is that you have to do this while at the Zoo. For the above image, the camera was set to its widest aperture with auto focus on and zoomed in. By burst shooting, several shots were obtained that were pretty nice. The above was shot using a 18 to 200 mm zoom lens at 170mm, f/5.6, ISO 200, and -1 1/2 EV. Below is an example of how it looked when it did not work. The image on left does not really show the fencing but it is not sharp at all and one on the right is what the fencing looked like. The image used was in a second set of burst shots that gave much better results. It seems you just have to keep trying until the fence disappears. This very striking Bonobo Monkey was sitting in a fairly high up crevice in the Kapok Tree, a new feature at the Jacksonville Zoo. This is a wonderful way for the whole family to view these fun-to-watch monkeys up close. The camera was set up with a telephoto 70-300 mm zoom lens and 300 mm was used to get the close up image. The aperture was set to F/8.0, I could have gone a little wider but this setting seemed to be working. The ISO was set to 400, which allows the shutter speed to increase for this difficult image. In this case the fence was fairly close to me, but the monkey was not. Unfortunately my Exposure Compensation was off a bit at -2 1/2 but it worked out fine – it just made the shot a little darker. 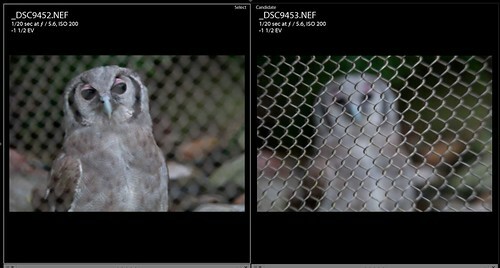 In the screen capture below a fence shot is shown and then the used RAW file that did require some light clean up. (Click on images to see larger in Flickr.) 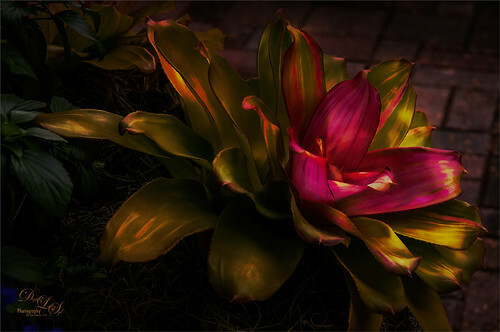 See my Image 2 Post Processing Info on the other steps used and how the lighting effect was created. If you look closely at the RAW file above (especially through the forehead and ear area), there are definite faint white lines still in the image. The fix? A Darken Curves Adjustment Layer set up so that the curve will overall darken down the image – mine is set up as an action with just one point set to Input 164 and Output 102. Then the layer mask was inverted to black by CTRL+I on the mask. Now with a soft 20-30% opacity round brush, painted over those light lines – set the size to roughly match the width of the lines. If it is too dark, go back into the Curves Adjustment itself and move the point up or down to match. I have used this trick over and over when light is not quite even on an image. And running the image through a sharpener like Topaz (see my Tidbits Blog sidebar for website link) Studio’s AI Clear and for that matter Precision Detail which can help remove an overall soft effect that can result with the fence interference. 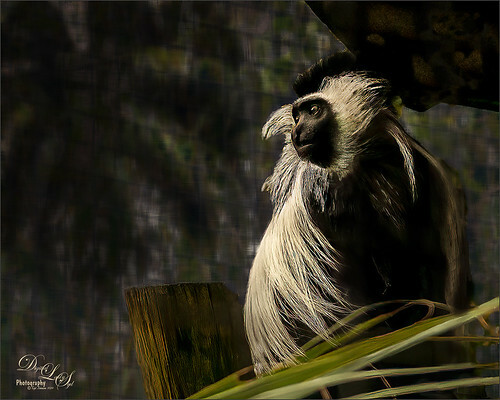 In the Monkey image the light fence effect was left on the right background as I felt it added a nice soft texture effect to the image. This could have been removed using a Lighten Curves Adjustment Layer. To create a Lighten Curves Adjustment Layer, just set the point to Input 98 and Output 170 and fill the mask with black – paint back area to lighten – then adjust the point to match the surroundings. The shooting technique does not work all the time. With the two images above the animal was pretty stationery and the fence fairly close, but when an animal is moving, it is hard to get a good focus on the subject. Doing everything that can be done to speed up the shutter speed, like setting the ISO higher, or turning off the Auto focus setting can help, but sometimes nothing works. If you really want the image, you need to take several shots of the moving animal so pieces can be patched into one if needed. Now you have to resort to removing the fence by hand and hoping you can clone over parts in different images you may have taken. This was done on the Amur Leopard image below. My main tools to start the process are using the Spot Healing Tool set to Content Aware and Sample All Layers, and the Patch Tool – mine is usually set to Patch Content-Aware, Structure 7, Color 5 and Sample All Layers checked. Adjust the Patch Tool settings if those do not work with your picture. After doing this, most of my time is spent using a small brush to sample and dab paint over areas that look rough – this is quite tedious and several different brushes is sometimes necessary. I do most of my spot removing, cloning and painting on individual layers and create a stamped layer (CTRL+SHIFT+ALT+E) on top to finish up. This may be obvious, but a major key point here is that, if you decided to use a texture to remove a very cluttered background especially, just remove the fence on the subject only. Then create a selection of your subject and place him on top of a different texture. Usually I place a white layer under the subject, then a texture and finally the subject so that blend modes and layer opacity changes can be used. That is what was done on this image. A lot of spot removing and painting to get rid of the fence and a separate image was flipped and copied over to get the jaw area to look correct. (In screen capture below the original RAW files with the main one used on the left and the copied jaw on the right.) It took several hours to get the image to this point, and I am not sure it is done. He was very agitated in his pen and was pacing and roaring all over the place – very hard to get a sharp image and his mouth really was open and big. Probably 20 pictures were taken (18-200 mm lens at 200 mm, F/5.6, ISO 640, and EV -1 1/2). This was really a difficult shot to get to look realistic while capturing the mood of the big cat. 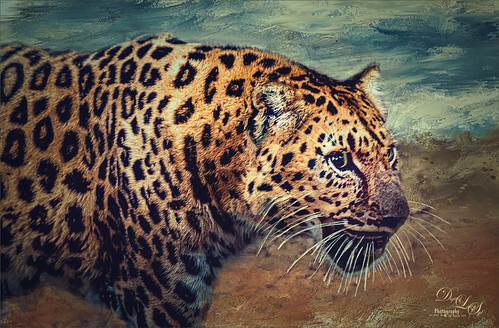 The background texture is one I painted in Corel Painter that had some complementary colors to the leopard. Just about everything was used on this image – Topaz Studio’s Precision Detail and Dehaze, Nik Viveza 2 to bring out the eyes, a Black and White Adjustment Layer set to Luminosity blend mode, Lighten and Darken Curves Adjustment Layers, spotlight effect layers, Color Lookup Adjustment Layer, the Sharpen Tool and Selective Color Adjustment Layer, just to name some of them. His eyes were amazing in several of the images. Another way to handle the fencing is to remove or paint over the subject and leave the fencing in place – it can possibly look like a fence behind the subject. The image below used this technique. The Monkey image has a similar but less obvious effect on the right side of the image. 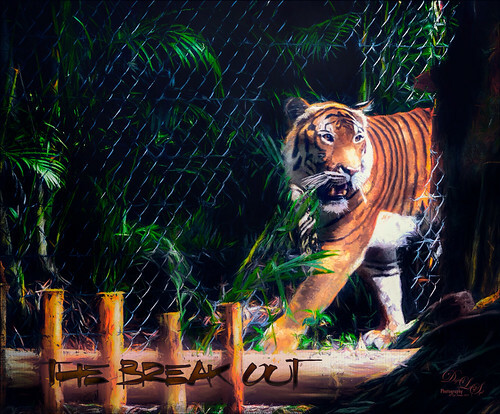 For more info on how the Tiger image was post-processed, check out a short Tidbits Blog I did a while back called The Break Out. It took a lot of time and effort to get this image – to paint out the fencing, one of my a painting brushes, which is based upon a hair brush and set to 35% brush opacity and 65% Flow, was used to sample and paint over the black lines – but it can be done. 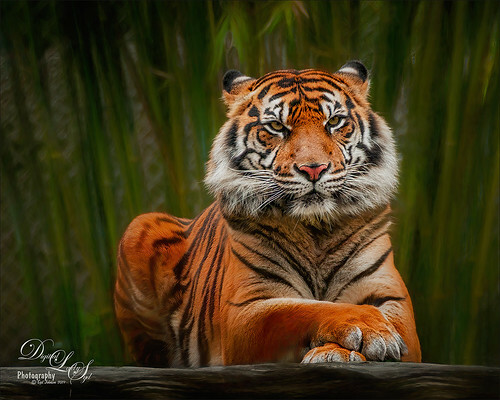 Topaz Impression was used to gave the Tiger a painterly look instead of hand-painting the whole image back in. Image 1: In Lightroom Serge Ramelli’s Safari Animal Vignette Cold Strong preset was used as starter (see my Showing Some of Serge Ramelli’s Effects blog to download them) and then tweaked the Basic, Detail, and HSL panels. In PS Topaz Studio’s AI Clear came to the rescue – used Remove Noise Auto and Sharpen High, Recover Details 0.10, and Exposure 0.21 – then set it to an opacity of 0.71 before applying. Next the Precision Detail Adjustment was added to just the Shadow areas. Last step used the HSL Adjustment to firm up the color in the eyebrows and beak – used a black mask and painted back those areas. I could not believe how good his eyes looked, just needed a little sharpening to pop them with an Exposure Adjustment Layer (see my The Eyes Have – How to Make Them Pop in an Image blog). This is pretty much my standard Topaz workflow for animals. In Photoshop Dodging and Burning was achieved with Lighten and Darken Curves Adjustment Layers. A little white spotlight effect on just his face using a layer set to Soft Light and white brush with low opacity, and that was it. To get that pretty background color, the Charcoal Filter was used on a stamped layer in Photoshop (had to convert the image to 8 bit before using) and set the Thickness to 4, Detail to 5, and Light/Dark Balance to 47 with foreground color a brownish color (2a2319) and background color greenish (1c2715) – this filter uses the Foreground and Background colors in the swatch. The layer was set to Exclusion blend mode at 78% opacity. Used regular soft round brush in mask painting over the Owl head and used the Sharpen Tool on eyes in mask. Image 2: In Lightroom no preset was used – just adjusted the Basic Panel and the HSL Panel. This time the image was brought into PS as a Smart Object so the LR settings could be tweaked easily if needed in Adobe Camera Raw. Since this image had more problems than the owl above, I felt this might be needed. In PS The first thing done was to add a Darken Curves Adjustment Layer to paint out the light white fence lines where the fencing was not completely removed. A little clean up was done before a stamped layer was created for Topaz Studio. In Studio the AI Clear Adjustment set to its default settings and then Precision Detail Adjustment was used with Shadow Small Detail 0.22, Shadow Medium Detail 0.43, and Large Shadow Boost – painted in a mask of just the monkey so detail only goes on him – kept Edge Aware on and inverted the mask so the background is black and not affected by the detail. Back in Photoshop a Gradient Map was applied using a gray to brown to light blue preset from Blake Rudis (see his nice gradient presets in download from Advanced Color Toning Made Easy video – excellent video). A vignette was created. Then I decided that I needed a little more light on the image so a large Spotlight Effect was created on the Monkey – just washed it over the Monkey from the opening. A few other steps were done, but this describes the major steps. WHAT IS TOPAZ’S NEW JPEG TO RAW AI? I am with most of you – say what?????? I knew Topaz (see my Tidbits Blog for website link) was working on some new software for JPG’s but this one is a real surprise. I have been working with the stand alone program for a couple of weeks, but it has taken a while for its wonderful capabilities to sink into my head. So this is what is going on…..it is somewhat similar to AI Gigapixel which I totally love and AI Clear which I can’t live without. (See my The Best New Software Around – Topaz A.I. Gigapixel! blog.) JPEG to Raw AI (J2r) uses similar machine learning technology to recover lost detail in jpg files and convert them to a dng or tiff extension. This will open up the Raw Converter in Photoshop or gives better slider capabilities in Lightroom. There is not a lot of info released on this software yet so their website seems to be the best resource to find out more info and where a trial version can be downloaded. Below is a rundown of what Topaz is saying about their product. Topaz states “There’s also enhanced dynamic ranges as shown by deeper shadows and enhanced highlights.” This is important and to me and is the best way to see results from applying the software. The program basically helps clean up jpg issues from smart phones, especially from some of the earlier versions, and older digital camera shots that just created jpg images. J2r uses the ProPhoto RGB Color Space that Lightroom uses. Most jpg files contain the sRGB color space which has very limited color choices. With the ProPhoto color space there will be better saturation and vibrance without any visible artifacting in your image. When an image is run through the program, it goes from 8-bit mode to 16-bit mode. 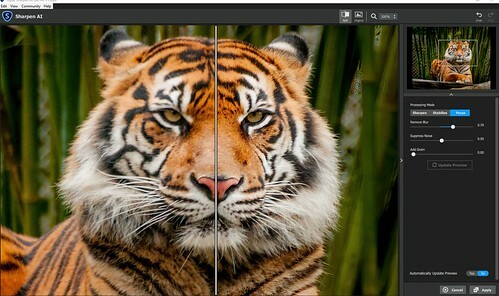 This removes banding and converts the image from 72 dpi to 300 dpi, which usually results in a more normal sized file. I personally really like this. I hate opening up Image Size in PS to find out my image is at 72 bit resolution and 72 inches tall! Also, changing the resolution and downsizing in PS can be tricky. The image above is one of my recent phone shots taken at a local Lowe’s Garden Shop using an older Android phone. 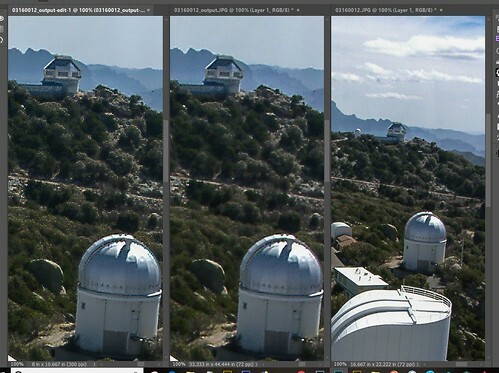 Below is a before close-up of the original out-of-phone jpg on the left and the converted to a dng file on the right. It is a very subtle adjustment, but look carefully at the lower green leaves to see more detail in the shadow areas of the dng file and a little more definition in the bright areas of the lower right petals. Even the yellow centers seem a bit more defined. In PS Topaz Studio’s AI Clear Adjustment was applied (I use it on just about every image). The final post-processing for the image above used a clean up layer, a little fine line dodging and burning (see my The Best Dodging and Burning Technique! blog using John Paul Caponigro’s technique), a Curves Adjustment Layer, and a painted in vignette. I have had a bit of a problem figuring out why some of my images improve when run through the program and some not so much. One of the engineers explained in their presentation: “While it will remove noise/blur and recover some detail, you’ll see most of the benefits when you try to edit the photo. Viewing a well-exposed high-quality JPEG before and after running it through J2r may not show a huge difference, but your editing capacity for that same image will generally go up.” After working with the program quite a bit, I believe this is very true. Since I use PS more creatively, I may not notice color shifts or tone changes as readily as many photographers who are looking to improve many of their less desirable images. Below is another example of what this software will do – this time a Casio QV-2900UX, a 2.1 Megapixel camera with a 8X zoom creating only jpg images, was selected. I was pretty impressed with the results – the image on the right is the original jpg file, the middle is the image after running through AI Gigapixel, it is still a jpg file, and on the left is the dng file. It definitely has a lot more detail – I thought it was a little crunchy for my taste but then realized it was little flowers showing up. Who knew they were there? On the sky to mountain line, there was some fringing going on after AI Gigapixel was applied. For the final image below, the fringing was removed by just painting on a new layer over with a small sized Clone Stamp. There was no fringing anywhere else on the image. 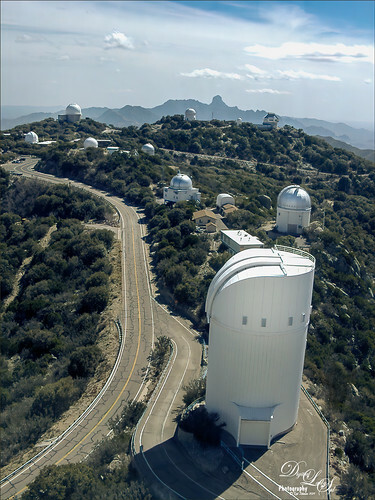 A gradient map was added with blue and cream tones set to Soft Light blend mode at 71% opacity, a spotlight effect on a few of bright areas of the telescope domes, and Topaz Studio’s AI Clear at default settings. Overall the image turned out really nice and so much better than when I first post processed it back in 2004. We’ve come a long way! What is the Difference between AI Gigapixel, AI Clear and JPEG to RAW AI? 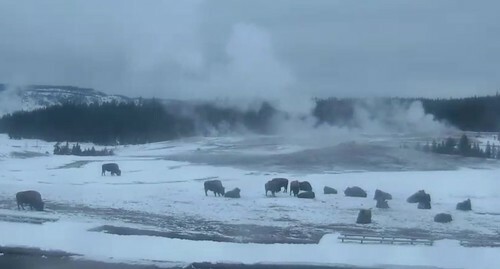 Below is a screen capture image using Snip It that is from the Old Faithful web cam in Yellowstone National Park on January 31st in the early morning- I had never seen bison in the cam camera before and it looked spectacular! There appears to another geyser erupting in the background and Old Faithful was spewing pretty steadily so there was a lot of mist in the air. The screen shot was run through JPEG to RAW first to create a dng file (_edit is added to the end of the file name so you know this program was used). A Tiff file should have been selected, but I was not sure what I was doing. Then I ran it through AI Gigapixel set to 4 times creating a Tiff – Gigapixel puts the _output suffix on the file name. I will tell you what else I did but it is not pertinent to the new program so skip this paragraph if not interested. Next PS was used to open the image and ACR opened up where some changes were made. No sharpening was done at this point. Then it was opened as a Smart Object in PS and cropped. Lucis Pro was used to sharpen the bison – black mask and just the bison painted back. I imagine I could have added the sharpening in ACR. 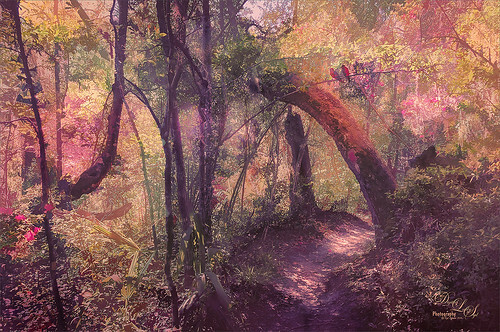 A Color Look Up table was applied – one I created to just create a sketch effect. Now the real magic came with using Topaz Studio – AI Clear (set to defaults and Exposure -0.08, and Clarity 0.48). Next the Edges Adjustment was used – this can really sharpen up an image and worked great on the bison (Edge Tone Dark, Edge Strength 0.15, Suppress Weak Edges 0.21, Suppress Small Edge 0.02, Edge Thickness 0.16, and Edge Resolution 1.00). Precision Detail Adjustment was added (Overall Small Detail 0.30, Overall Medium Detail 0.43, and Overall Large Detail 0.36-used a Gradient Mask set in middle of the image so sky was not affected, just the middle ground and foreground); and Impression Adjustment used the default settings (set Number of Strokes to High, Stroke Color Variation set to 0.25 and Spill 0.32). 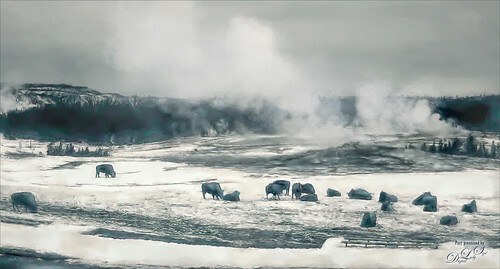 To recreate a better mist effect, on a separate layer a fog brush was used to fill in where the screen shot lacked mist and several Grut Cloud brushes (the best around by far) were used to enhance this soft effect. Okay, here is the original so you can see what a difference this made – all three programs – J2r, AI Gigapixel, and Topaz Studio – helped create the above.